When noticing major market moves during news releases: 30, 50 or even 100 pip movements inside of a few minutes; you are probably asking yourself, 'why am I not grabbing a few of those pips?' The truth of that matter is that while it looks easy, that is usually not the case. During major market news prices move up and down very quickly, spreads often widen, and it may be difficult to get your orders filled. News traders understand that while grabbing those large pip movements looks easy, it can also be very frustrating. Your main objective will be to determine the country and currency the release pertains to, and of course the time of the release. This will establish your key area of focus, or which currency pairs to trade. You do not have to trade every announcement. Here is a list of some of the better U.S. market news announcement topics. You can look for similar reports from other countries that will also cause sizable market volatility. Trading news announcements can be the riskiest type of trading you might embark upon. Many traders loose more trying to trade the news than they do trading with any other style or approach. The most profitable way I have found to take advantage of a news announcement is to wait for certain trading signals, signals that I have found tend to indicate the best entry points. You should never just enter a trade with a guess of which way you think the market is going to move. You may have to wait 5 to 30 minutes before you see a proper entry signal. Another key time factor I monitor is the pip spreads, as they can often widen during the first few minutes of a major news release, I tend to wait for the spreads to calm down and return normal before placing a trade. In this manner, I can better trust that the market may have a true direction. The time frame I prefer when trading the news is the 5 minute time frame. I have noticed that the 1 minute chart tends to show too much noise (quick up and down movement). In my experience you can get some good signals and make a trade on the overall direction of the move while analyzing the 5 minute chart. During the first 5 to approximately 30 minutes you may just watch the market move up or down, not giving you a good signal. 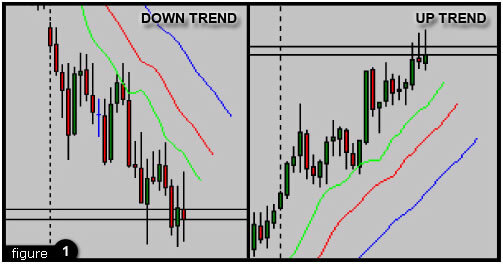 But once you do identify a proper signal, from the indicators you like to trade, then it can be a good move. As a side note, one of the great things about focusing on news releases is that they are scheduled in advance so you know exactly when you should schedule your trading hours. 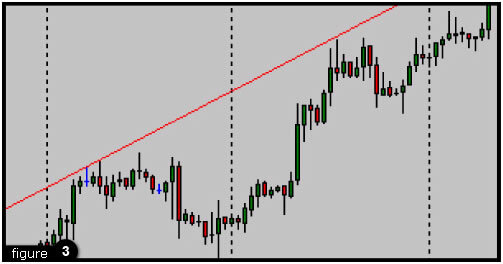 When trading the news, I commonly see many people place pending orders with tight stop losses. Then they find themselves in and out of the market in a few short minutes, or even seconds, having realized big losses. This happens because of the spreads widening. With a 10 pip stop loss and the spread widening to 12, for example, you would be in and out of the market as soon as your trade was hit. The best way is to trade with the direction of the trade, the way the market decides to go, and not try to guess which way it will go. The market moves, not so much in reaction to the exact data of the announcement, but by the reaction of the traders to the news itself, and the data's alignment or lack thereof with what was expected. A key thing to watch for is a quiet market in the hours pending the news release. In other words, the market is moving sideways. When this happens then the market is poised for a nice move. Another observation that is certainly of key importance is to check the direction of the trend on the currency pair you are going to trade. To check the trend I use the 4 hour chart. I do a couple of things to help me better understand the trend. First, I put on the alligator indicator for a quick look at the strength of the trend. If all three lines are pointing up in a 1 to 2 o'clock angle then it is an uptrend and If all three lines are pointing down in a 4 to 5 o'clock angle then it is an down trend. 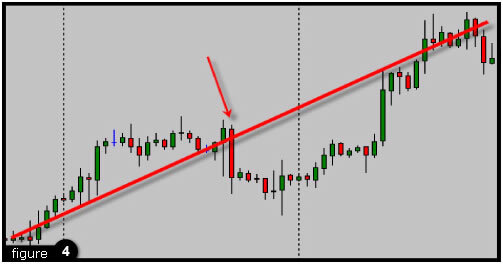 Another way to get a general direction of the trend is to look at a 4 hour chart and draw a line from the point where your price bars start on the screen to where they end and get a direction that way. 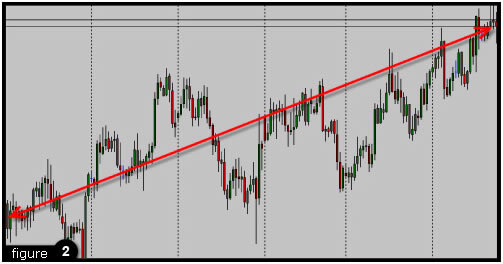 You can also draw simple trend lines if you feel comfortable with trend lines. Once you have an idea of the direction of the trend, and depending on its relative strength, it may be wise to trade the news announcement in that same direction. In other words, if the market is trending strongly before the news announcement, you will be better off not fighting that trend. When the trend is UP, on the 4 HR chart, and the news drives the market DOWN, after a drop in the price, watch for a turn in the price to the up side with a continuation of the direction of the trend. This would be referred to as a 'whipsaw' and is a very common market reaction to moves driven by the news. Don't fall victim to the whipsaw, rather, wait for the market's true reaction. When the trend is down, on the 4 HR chart, and the news drives the market up. Watch for a turn to the down side with a continuation of the trend. When trading the news don't think of the market as an ATM machine that owes you instant cash, or a certain number of pips. When you buy there is always someone on the other end selling. So if 20 people show up to buy and there are only 10 lots for sell then someone will not be filled until some more lots show up. When the price gets good enough for the seller then you may buy, but it may not be at the price you would like. Trading any strategy takes time and practice. You need to become good with your indicators and trust what they are telling you. If you trade the news right, you should be looking to grab a few pips from the middle of the move. Don't reach for the tops and bottoms of the volatility caused by the news, as often you will be misled by doing so. Be patient with your analysis and try to trade with the previous trend of the currency. Trading the news is no simple task, but success can be had if you can avoid the greed of trying to capture the entire market move. Instead, wait out potential whipsaws, follow the trend, and be content to grab a small portion of the market's move.